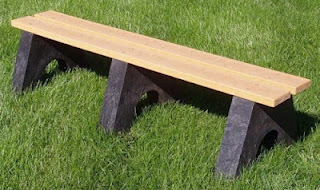 AAA State of Play Blog: Why Buy Recycled Benches? If you are planning to install some high quality benches in your playground or community park then we advise you to go for recycled outdoor benches. These certainly have an edge over regular benches that are constructed using wood, steel and aluminum. Recycled benches are constructed using post-consumer material that includes waste plastic water bottles, plastic milk jugs and the like. These are compounded with permanent UV-stabilized colors and do not need to be resurfaced, painted, waterproofed and stained. Also, these have high moisture absorbing tendency and are considered more strong & durable than regular benches. Recycled plastic benches are light in weight and can be easily moved from one place to another in park. Unlike regular benches made of aluminum, metal or wood, these do not crack, splinter or rust after a period of time. Moreover, these have weather resistant property; therefore, can easily withstand harsh climatic conditions. Manufacturers create the recycled benches in a wide variety of colors and designs. You can choose the one which can completely gel in the entire look of your park. Before you buy one, ensure that manufacturer has designed it as per guidelines defined by American Society for Testing and Materials (ASTM) and Consumer Product Safety Commission (CPSC). To know further about recycled outdoor benches, you can contact AAA State of Play.